After Monday’s 44-7 dismantling of previously unbeaten Smethport in the District 9 Class 1A Championship game at Karns City, the 8-4 Falcons land in the PIAA quarterfinal round against District 10 champion Farrell. Kickoff against the powerful 12-0 Steelers, who routed District 5 champion Shade 56-8 in a first-round PIAA game last Saturday in Somerset, is set for 1 p.m. at Slippery Rock University. It’s the first state playoff game for the Falcons since 2006 when they fell 12-8 to D10 champion West Middlesex in the quarterfinals. In 2005, the Falcons outgunned another D10 champ Kennedy Catholic 48-42 in double-overtime. That landed them in the semifinals where they lost 33-2 to Duquesne. Since then, only one D9 Class 1A team has won in the quarterfinals when Clarion knocked beat D10 champion Lakeview 35-20 in 2013. No D9 team has beaten Farrell in the state playoffs. The Steelers eliminated Ridgway the past two seasons — 36-0 and 20-7 — and Kane in a 27-6 win in 2015. This year, the Steelers have outscored their 12 foes by a whopping margin of 635-81, scoring 50 or more points in seven games. Only three teams have managed to score more than one touchdown against Farrell, including D10 Class 2A champion Wilmington in a 31-19 Steelers win on Aug. 31. Farrell, coached by Jarrett Samuels, is averaging 429 yards per game offensively, led by standout running back Christian Lewis. He’s rushed for 1,922 yards, averaging 12.4 yards per carry, with 23 touchdowns. Jaden Harrison has rushed for 646 yards and eight TDs while quarterback Kyi Wright is a dangerous two-way threat, throwing for 1,370 yards and 25 TDs against just one interception while running for 496 yards and 12 TDs. Wright’s top receiving target is Jourdan Townsend (60-997, 21 TDs), who has combined with Lewis to score 326 points, or just over half of Farrell’s 52.9 points per game. The Falcons have enjoyed a postseason ride that’s included three straight wins against teams that beat them during the regular season — Redbank Valley, Clarion-Limestone and Smethport — average 300 yards per game offensively. Leading the charge is senior running back Stephen Kelly, who ran for 330 yards and five touchdowns against the Hubbers Monday. He’s up to 1,746 yards rushing for the season along with 28 TDs. Quarterback Hayden Keck has thrown for 698 yards and eight touchdowns while rushing for 481 yards and 12 TDs. Keck’s top receiving target is John Minor (11-367, 3 TDs). Defensively, Eli Ayers (7.8) leads the Falcons in tackles per game, followed by Keck (4.8) and Travis Gleason (4.4), who leads the team with 11 sacks. Miner has a team-high four interceptions. 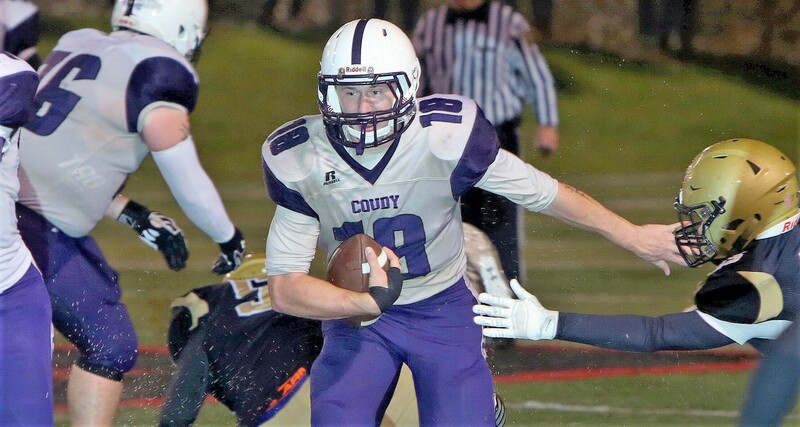 Coudersport’s first two state playoff games were in 1994 and 2001 when the Falcons lost to Kennedy Christian (21-14) and Sharpsville (25-12) respectively. Farrell’s other wins against D9 teams in the state playoffs were Cameron County (31-0) in 2008, Clarion (19-14) in 2009, Curwensville (35-14) in 2010 and Smethport in the 1995 semifinals (14-0) and 1990 semifinals (63-14). The Steelers lost in the 2015 state finals, won back-to-back crowns in 1995 and 1996 and lost in the 1990 final.